Arrived in Belgium almost ten years ago, he studied with Paul Dombrecht, F. Leleux, J. Thys, D. Walter, N. Black, E. Speller, and played in the Flemish Radio Orchestra (VRO ), the Orchester de la Monnaie Orchestra. He formed the Ensemble Priamide, the Calamos Trio and officies as oboe teacher in the academies of Montigny-le-Tilleul, Gosselies and Charleroi. Attracted by the beauty of choral singing, he studied direction with Mario Lanaro, Diego Dini Ciacci, Julius Kalmar and recently with Denis Menier. He has been working on La Monnaie’s “A Bridge Between Two Worlds” project since 2007, where he conducts choral workshops for people who are socially vulnerable both in institutions, at “La Monnaie” and in prisons. 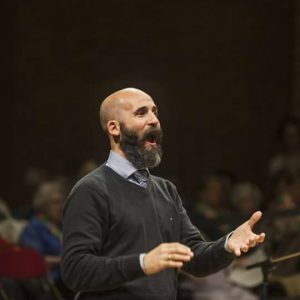 He conducts the Melting Vox vocal ensemble, Les Baladins de Fleurus, the choir “Accroche chœur” and teaches the richness of sound in choral singing in private. Since October 2014 he leads the “ensemble vocale Ishango de Namur”.